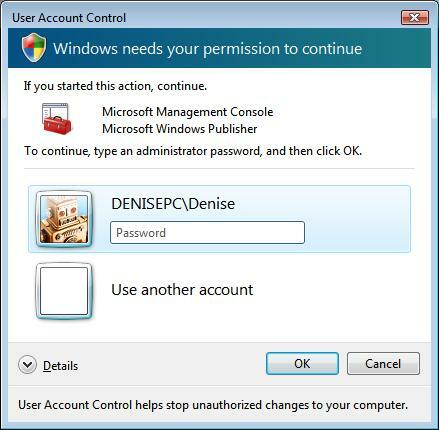 User Account Control (UAC) is a new security feature in Windows Vista that requires all users to log on and run in standard user privileges mode instead of as administrator with full administrative rights, thus prevent unauthorized or accidental changes that could destabilize the computers or allows virus and malware to exploit the system-level privileges provided to the local administrator to attack the network security, compromise computer safety and privacy, and damage files and settings in the network. However, in a lot of cases, administrator rights are needed by end-users to perform certain tasks such as install or update programs and perform typical system-level task. Beside, many software applications also need administrator privileges to run properly without conflicts, as they are designed to write to system locations during normal operation, and computer in locked-down state in which users operate in standard user mode severely limits user productivity. In Windows Vista, as and when standard end-user requires administrator privileges to perform certain tasks such as attempting to install an application or write to registry, Windows Vista will prompt a UAC credential prompt to notify the user that a credential of administrator user account is needed for authorization or permission, thus reduce the chance user can accidentally make modifications to vista system files or settings and eliminate the ability for virus or malware to invoke administrator privileges without a user’s knowledge. Even for domain or local administrator, with UAC turns on and enable, most applications, components and processes will run with a limited privilege, but have “elevation potential” or Administrator Approval Mode where administrators must give consent through a User Account Control consent prompt. However, these security clearance and prompting processes may felt by a lot of users as too troublesome, and sometime annoying especially when you’re the only single user who uses the computer, and has all the latest anti-virus and anti-spyware utilities installed and updated. User Account Control is enabled by default in Windows Vista, so you will have to turn off and disable the User Account Control. 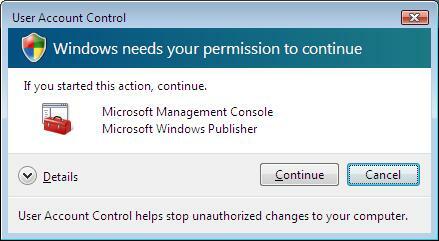 However, Microsoft recommends that users do not turn off UAC for security reason. There are a few ways that you can use to turn off the UAC, but most home and personal users should find method to disable UAC via Control Panel easiest to do. Click Start and then open Control Panel. Clear the tick or check mark on the box beside the Use User Account Control (UAC) to help protect your computer option. When prompted, restart the computer. Note that the changes will affect all users on the computer. To enable the UAC, simply tick or select the checkbox again. A similar method with method 1, but access to UAC via a user account. Click on Add or remove user account option. Click to select any user account. Click Change security settings under “Make changes to your user account” section. Run Registry Editor by typing “regedit” in Start Search or command prompt. Right click and choose modify or double click on EnableLUA to modify the setting. On valud prompt, set the new value to 0. To enable the UAC again, simply change back the value of EnableLUA to 1. Run MsConfig from Run option. In System Configuration window, click on the Tools tab. Scroll down and locate “Disable UAP” or “Disable UAC” option item. Click on that line. A command prompt window will open and automatically execute and run certain process to disable UAC. Close CMD window when done. Restart computer for changes to apply and effective. To re-enable UAC, simply select “Enable UAP” or “Enable UAC” instead of “Disable UAP” or “Disable UAC”, and then click on Launch button. If you’re an IT administrator or system administrator that manages many Windows Vista computers or clients across your computer, group policy can be an effective and easy to mass enable or disable a group of computers. To disable UAC, both Local Group Policy or Active Directory GPO can be used. Type gpedit.msc and click OK to open the Group Policy Editor. Note: If you’re using Active Directory Domain GPO which controls many computers, open Group Policy Management Console by click on Start -> Run, then type gpmc.msc and click OK from a Windows Vista computer that is a member of the AD domain. In the Group Policy Management Console (GPMC) window, browse to the respective GPO which is linked and enabled to the OU (organization unit) or domain where the Vista computers are located, then edit it. Navigate and browse to Computer Configuration -> Windows Settings -> Security Settings -> Local Policies -> Security Options. In the right details pane, locate the User Access Control policies. TweakUAC allows users to easily turn on or turn off UAC with a single click, or put UAC into silent mode where all admin users will be auto escalate when needed. Note: After disable and turn off UAC, a little red X shield icon of Windows Security Center comes out in the notification area. Here’s the way to get rid of the icon and notifications.